A couple of walks at work and an easy morning jog on the TM at gym to WU for some sqauts and deadlifts circuit - 20 minutes. noon in Greensburg. Meeting for work and then ran at lunch. Found a good 200m hill and hit it: 10 x 200m hills - about 45 second avg. PM: Hoka demo at White River Run Shop in town at 6:15. Pretty cool - ran 4 miles in some Hokas. A bunch of cusion, but, those things are pretty expensive. Walk with kids - Jude running around the block a little bit now. 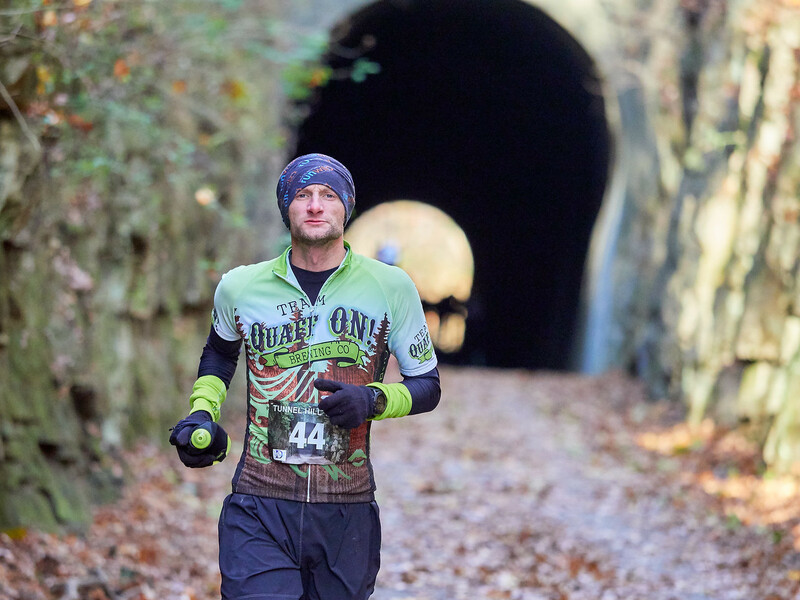 9am - DINO Trail Race in Brown Co. State Park. 8.62 miles GPS, and about 1000' of elevation gain. Pretty tough course, and I struggled. Coming down one of the big decents I fell pretty hard and landed on shoulder, elbow, face. Other than that, quite an enjoyable race in the woods. 8.62 miles in 1:07:24 for about 8th place. Feeling tired and very sore. Tough week. AM - TM at gym before work - 3.5 AT cutdown 9mph up to 10.1 mph. 6mi. totl - 43:30. Indoor Running on new watch was 0.6 short of what TM said I ran. New shoes I bought off peer at work - Saucony Triumph Iso (?) Light wieght Trainer, I think? Anyway, there pretty plush, roomy, and bouncy. walk at work in am, lunch run - 5miles easy - 42:11. PM run after kids in bed. Nice evening out tonight - breezy and about 70 deg. 7 miles in about an hour. Walk at work, and 5mi. moderate trail effort during lunch break, after meeting in Clarksville. Silver Creek Trail was not too muddy today - a whole lot more down branches and a bunch of people out golfing on this fine summer morn. about 3 mi. of AT effort. PM run - heading out of house intending to do a workout... Some strange shooting pains in my right hammie/lower back. stoppped running immediately and walked about a half a mile. Did a couple of drills to loosen up, which seemed to work. Slowly jogged a couple more miles around the neighborhood to make sure. Everything seemed to be fine now. Not sure waht that was? AM Long run in the sun. IT was really more like 2 mid LR: 2 x ~2hrs with a family pool break in the middle. Kids first time at public pool was fun. There's a toddler hour from 10a-11a where everybody gets in for 1 dollar to Donner Aq. Cntr. Lots of ountains and play things in the shallow waters for the little ones. It was special. The run was pretty tough - it was hot today - about 85 degrees near the end, and I drained a lot of water to try and keep up. 26.21 mi. - 3:50:33. AM run - easy 90 min. in the heat- 10.54 mi. - 1:33:33. Real tired in the legs. AM walk at work. Lunch run at work - out and back down 4th street. 6 mi. - about 8:45 pace. Hot!! AM - Track Workout at local high school track close to work. 1400m, 2x1k @10k, 5x400 @5k: 200 jog recovery btwn. each rep.
5:04, 3:33, 3:27, 78, 78, 78, 77, and 73. Didn't realize I had gone an extra lap on first rep - was supposed to be 1k. Lunch TM workout - it started raining pretty hard prior to leaving the office, fortunately. 3x0.5mi. hills 9% - 7mph down to 6.7mph. Went in to Squats circuit and coreafterward for about 20 minutes. 2 walks and a lunch run - easy 4mi. 23.5 miles trails with some good climbing - 4 hours. Late AM run - ate the Bob Evan's Father's Day Breakfast, and felt it. Temps rose quickly after the 10:30 start. One bathroom stop on the out and back to Harrison Lakes. 14.21 miles slow - 2:06:59. Suffered some less than comfortable heartburn the whole way. Hot! AM walk at work. Not hot yet. Lunch time it was 85 degrees and climbing. PM walk at work - Hot! PM - run around fairgrounds and neighborhood. Humid, but, not blazing hot at 8pm.Cut down for a couple miles and then relaxed pace. A lot of foods still sitting in my stomach. 6mi. - 46:31. PM run with Nathan - good company and good to catch up with him. PM run - cut down a little bit at the end. Terrace Lake, Tipton loop. A bunch of walking at work. AM 5k race starting at Mill Race PArk. No intentions of a fast day. 10am start left everybody a little slower at the finish. Ran over to M. Race from the house and then went through the course once at roughly MP prior to race. Really no freshness/pop in the legs at all. Struggled with 6 min. pace and slowed throughout actual race. LRb - 9am start from house. Already about 80 and sunny. Ran around Columbus for while hopping from water fountain to water fountain in the parks. Left my handheld in the QuaffForce1 truck yesterday. 22.25 miles total with lots of stops - 3:14:03. Pretty cooked at the end. AM run home from work - Seymour to Columbus the non-SR 11 route. Started at 10:30 am with 2 full bottles of dilluted gatorade mix. It wasn't enough. 80-85 degrees and sunny. I was lathered up in sunscreen, fortunately. Slow and started getting hungry half way through. Gatorade wasn't nearly enough. Fire station on CR 450 was fortunately placed - filled up bottle there and dipped the hat in the water. That at least got me home. Part 1 of LR double - 21.5 miles - 3:13:30. Some walking later in the day with the family was a struggle. Early 5 AM Lnog Run (part 2 of double) - back to work from house. Took shorter route down SR 11. Pretty cool that a resurface job is going on there (SR 11 from interchange to edge of town) and afforded me the unique privelage of running down the middle of the lane over the E. Fork bridge. A lot of unhappy cars backed up in the que watched me run passed them. A lot cooler outside at max 60 degrees. Left leg hurt for about 2 miles to start, but, warmed up and quit its bitching. Fortunately, its that time of year, again - when the corn is getting higher (enough for pit stops). Had 2 major pit stops. Carried one bottle of water and carried some quaker oats cereal bars to eat since I am fresh out of gels. They are 100 calories of a bunch processed crap that went right through me. They got me through the run, at least, feeling like I had a decent amt. of energy and no gut cramps. 20 miles - 2:52:23 Some walking at work also. Almost 100 miles in five days and my left leg (inner quad / groin) needs some recovery time.